USSA has installed a number of projects utilizing California recycled tires that received funding through CalRecycle's Tire Incentive Program (TIP). 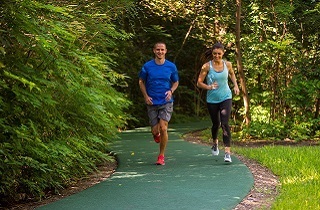 A Rubberway Evolution rubber jogging trail installed at the 5-star Houstonian hotel in Houston, Texas is still intact after being submerged in floodwaters for over a week following Hurricane Harvey. May 13, 2013. WRSG Irvine, California, USA: World Recycling Surfacing Group, the Irvine, California based premier provider of highly acclaimed artificial turf, rubber sidewalks, running tracks, green roofing and rubberized walkways, were honored at a formal gala event held in Chicago on April 25, 2013, as the GOLD winners of the 2013 Edison Green Award™ for their proprietary Rubberway® rubberized walkways. 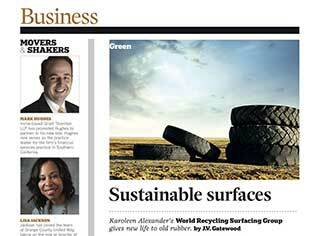 In the November 2010 edition of OC Metro, found in the "Green" segment of its contents, is the article titled "Sustainable Surfaces", showcasing World Recycling Surfacing Group's impact on the industry of diverting used tires from landfills. Often we get calls from our clients asking, "What exactly qualifies for the grant funding?". The answer is simple, yet a little confusing when trying to fund a large surfacing project. Only recycled rubber passenger tires qualify for the funding opportunity with Cal Recycle, so that does limit the available options provided by Rubberway.